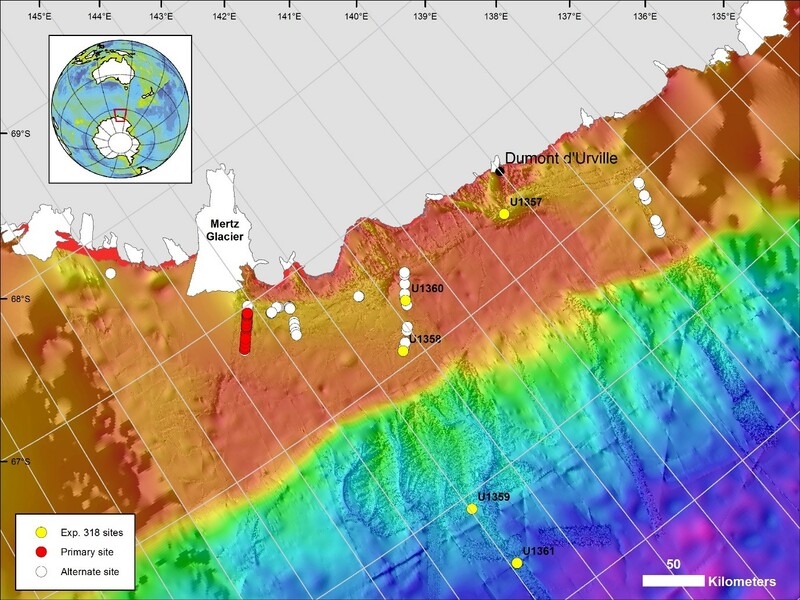 The proposal upon which this expedition is based was submitted as IODP Proposal 813-Full and Addendum 813-Add ‘Greenhouse to Icehouse Antarctic paleoclimate and ice history from George V Land and Adélie Land shelf sediments’. The George V and Adélie Land continental shelf of East Antarctica contains a record of Antarctica’s climate and ice history from the warm and vegetated landscapes of Eocene greenhouse climates to latest Eocene glacial inception and the dynamic ice-sheet margins. Because of the gently dipping strata and glacial erosion, sediments of a wide age range reach close to the sea bed and are accessible through shallow drilling by robotic seafloor drills. The history of this Antarctic margin includes warm-world high-CO2 environments, which will help to understand Antarctic climate and the limits of ice-sheet stability under future global warming. Up to now there are extremely few well-recovered Eocene sediment sequences from Antarctica, and we aim to fill this gap in knowledge. Climate cooling over the late Eocene in advance of main glacial inception – were there precursor glaciations? What conditions led to Antarctica becoming the ice-covered continent we see today? Oligocene ice and climate conditions, which are only poorly known. It should be noted that the recovery of Oligocene sediments is uncertain at this time. If the primary sites are inaccessible due to ice conditions, partly equivalent strata can be drilled at alternate sites. Also, Cretaceous and Miocene to Pliocene sediments are available at alternate sites that could address additional objectives, such as to enable dating of strata bounding major unconformities that can result from glacial advances and GIA-related vertical crustal motion. The expedition aims to drill, core, and log between eight and eighteen 50-m-deep boreholes on the George V Land and Adélie Land continental shelf of East Antarctica, using the British Geological Survey Rockdrill 2 (RD2), deployed from the RVIB Nathaniel B. Palmer, operated by the Lockheed-Martin Antarctic Support Contract (ASC) for the U.S. National Science Foundation’s United States Antarctic Program (USAP). To learn more about the scientific objectives of this expedition, life at sea, and how to apply to sail, please join us for a web-based seminar on Monday 29th August 2016 at 2pm BST (1pm GMT). To participate in the webinar, you will need access to the internet with a computer equipped with a microphone and speaker. To register, please visit https://www.surveymonkey.co.uk/r/IODP373.